Although it wasn’t unknown in the 18th century for a composer to set a libretto (usually by Metastasio) more than once, I can think of no other case that resembles Handel’s complex relationship to the story—derived from Ovid’s Metamorphoses—of the ill-fated love between the shepherd Acis and the sea nymph Galatea. Many will be familiar with his exquisite 1718 English Acis and Galatea, but far less well-known is the musically completely different Italian serenata he composed a decade earlier. But thanks to a visit to Lincoln Center’s White Light Festival on Saturday evening by Le Concert d’Astrée, an enthusiastic audience at Alice Tully Hall was treated to a rare and scintillating performance of Aci, Galatea e Polifemo. Also the basis of Lully’s final completed opera Acis et Galatée, the myth revolves around the cyclops Polyphemus whose amorous advances toward Galatea are rebuffed. A resulting rage prompts him to hurl a boulder which kills Acis, who is then transformed in death into a river where he is reunited with Galatea as she mournfully returns to her underwater home and her father, the sea-god Neptune. While not quite the story one might imagine cheering newlyweds, Aci was commissioned as part of a wedding celebration in Naples in 1708 during Handel’s life-changing four-year sojourn in Italy. During his time there, the prodigiously fecund composer wrote more than 100 cantatas and two operas, as well as his first important choral work, the Dixit Dominus, but unlike many of those works, Aci lived on. In London, in order to combat a rival pirated edition put on by Thomas Arne, Sr. (the father of the composer), Handel concocted a new Acis and Galatea, one that combined music from both versions, some music sung in English, some in Italian. Its 1732 premiere featured the castrato Senesino and soprano Anna Strada as the lovers, with the great bass Montagnana terrorizing them as Polifemo. This hybrid continued to be revived in a myriad of editions—this aria cut, that aria added—for years, with casts that included another important castrato, Carestini. The French harpsichordist and conductor Emmanuelle Haïm, who founded Le Concert d’Astrée in 2000, has long been fascinated by the music of Handel’s Italian period, recording for Virgin Classics not only Aci (the group’s first large-scale recording ), but also the two grand sacred works, La Resurrezione and Il trionfo del Tempo e del Disinganno , as well as a collection of chamber duets and some soprano cantatas with her longtime collaborator Natalie Dessay. So it was not surprising that she selected Aci for her group’s return to Lincoln Center where they debuted at the 2005 Mostly Mozart Festival performing, along with some Rameau, Handel’s great 1707 cantata Il Delirio Amoroso with soprano Magali Léger. Although not conceived to be staged, Aci nevertheless forms a propulsive drama, particularly effective in depicting Polifemo’s blustering infatuation and revenge; we’re a long way from Acis’s more benign Polyphemus. The Italian villain’s music is filled instead with violent extremes, from his strutting entrance “Sibilar l’angui d’Aletto” (later reused for Argante’s entrance in Handel’s first great London success, Rinaldo) to the celebrated lament “Fra l’ombre e gl’orrori” with its extraordinary leaps of more than octave. The lovers defy conventional expectations with Aci a high soprano and Galatea a contralto, although a female soprano and a male castrato respectively gender-bended the parts at the first performance. Haïm cast only one singer en travesti: German soprano Lydia Teuscher in her New York debut portrayed Aci, with French bass-baritone Laurent Naouri returning to Polifemo which he recorded with Le Concert d’Astrée in 2002 and the arresting French contralto Delphine Galou appearing for the first time in the US as Galatea. Despite the passing of more than a decade since the recording, Naouri remains a formidable cyclops. 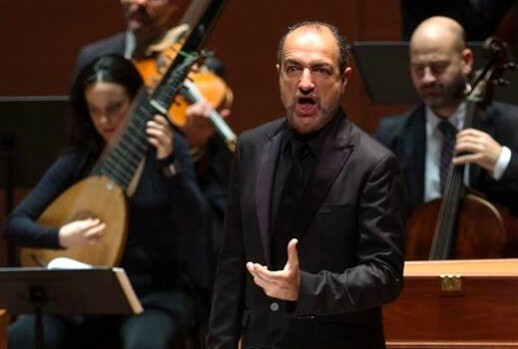 Although better known for his numerous appearances in French baroque opera, he has tackled these wide-ranging Handel roles like Lucifero in La Resurrezione before . Although the voice now has to work a little harder, particularly in the bravura of “Sibilar” which forced him to huff and puff his way through the coloratura, he soon recovered for a vigorous “Precipitoso,” a frightening simile aria about a rushing river that strikingly forecasts Aci’s eventual metamorphosis. If his interpretation evoked a spoiled roué more than a violent brute, he made something quite moving of his final accompagnato where he ruefully repeats Aci’s dying words as the shepherd triumphs in his watery reunion with Galatea. Teuscher revealed a sweetly shining soprano which reveled in Aci’s high-lying music. Her warm quick vibrato made a welcome change from the straight-toned voices one sometimes hears in the part, although it sometimes made it difficult to discern a trill. Occasionally one wanted to hear more of her words; however, she was particularly winning in “Qui l’augel da pianta in pianta,” Aci’s “bird” aria which Haïm consistently takes very slowly: Teuscher’s Saturday evening matched the tempo Haïm uses in her recording which takes nearly 11 minutes, where others I have heard usually run no more than seven. Teuscher’s hushed, finely-spun “Verso già col sangue” as Aci dies held the nearly sold-out audience breathless. Over the past few years, Galou has emerged as one of the most sought-after singers for early to mid-18th century music. With Marjana Mijanovic having crashed and burned, Sara Mingardo rarely appearing in opera, and Sonia Prina not singing nearly as well as she used to, many conductors now select Galou for important European performances and recordings. In her first US appearance, her Galatea showed what all the fuss has been about. The strikingly tall and thin Galou wields an unorthodox contralto—earthy, raw and not at all conventionally attractive; and yet her passionate commitment and vivid singing made Galatea’s increasingly desperate situation urgently immediate and moving. Although she began her career as harpsichordist for Les Arts Florissants and as William Christie’s assistant, Haïm’s music-making differs considerably from that group’s intense elegance. She, instead, strives for outsized contrasts which can result in some rough-and-ready moments. The first half of Aci took a while to settle down with the musicians’s bold playing drowning out the lovers’s blissful opening duet “Sorge il di,” as well as Galatea’s languorous first aria “Sforzano a piagere.” Too often, the singers’s challenging ornaments proved too ambitious, detracting from rather than adding to their performances of the many da capo arias. But things eventually righted themselves, and the second half was altogether more nuanced and polished. For those who may have missed this concert or its previous performances in France and Austria or who are just curious to hear Aci, Galatea e Polifemo, Glossa has just issued a marvelous new recording by Fabio Bonizzoni and La Risonanza. A follow-up to Bonizzoni’s indispensable seven-CD series of cantatas (also on Glossa), it features a fine cast of Roberta Invernizzi, Blandine Staskiewicz and Lisandro Abadie. As Aci, Invernizzi is perhaps less fresh and fluent than before but remains a consummate Handelian, while the stylish Staskiewicz reveals a smoother voice than Galou. The discovery of the recording is the young Argentinian bass-baritone whose agile and suavely vibrant Polifemo dominates the performance. Haïm’s 2002 Virgin Classics recording remains eminently recommendable with Naouri introducing his imposing Polifemo alongside the sterling lovers of Mingardo and Sandrine Piau, whose lucky appearance happened due to the vocal difficulties of the originally-scheduled Dessay. It’s too bad that Charles Medlam’s lovely Harmonia Mundi recording is out of print as it features Emma Kirkby in one of her better Handel outings and the underrated Carolyn Watkinson as a splendid Galatea, while David Thomas tries hard as Polifemo. Two other delectable fruits of Handel’s Italian years will be performed in New York over the next few months. His great cantata Apollo e Dafne for soprano and baritone arrives in mid-November at Carnegie’s Zankel Hall courtesy of the English group Arcangelo with Katherine Watson and Nikolay Borchev conducted by Jonathan Cohen. And Jennifer Peterson’s operamission continues its chronological exploration of Handel’s operas in January with his 1709 masterpiece Agrippina, performed in the Renaissance library of the Fabbri Mansion. The shepherd and his sea-nymph will again fear Polyphemus when the great American choreographer Mark Morris (whose ecstatic vision of Handel’s L’Allegro, Il Penseroso ed il Moderato closes the White Light Festival next month) returns to the composer next year for his next major project: a setting of Mozart’s adaptation of Acis and Galatea, albeit sung in English. It premieres in Berkeley in late April, then travels to Boston in May, eventually arriving at Lincoln Center which co-commissioned it.